Major British companies are hatching plans to relaunch their businesses in Libya just days after news of the apparent downfall of the Gaddafi regime. Previously war-torn capitals such as Baghdad and Kabul have rapidly become targets for western capitalism, with major US and European retailers now jostling for position on shopping streets. And already FTSE 100 constituents such as engineering firm Weir Group and oil major BP are seeking to make contact with Libyan officials as companies formulate early plans to return to a country they fled in February. He adds that the company has consulted with the Foreign Office – which still deems Libya too unsafe for British nationals to travel to – and attempted to speak with Libyan contacts. Weir had invested millions in the country and earlier this month it announced it would take a one-off charge of £2m following the “cessation of all Libyan project activity”. It was working on power plant refurbishment in Misrata; it is not clear whether that site has sustained any damage, the company says. 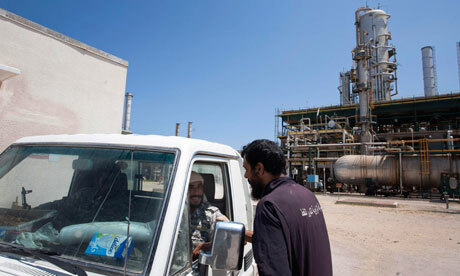 The British-based oil group, which still employs about 100 Libyan nationals, was forced to halt plans to explore offshore in the Gulf of Sirte and onshore in Ghadamis at the beginning of the uprising, which saw the country’s oil output plummet. BP had announced plans to spend upwards of £540m to fund a joint venture with the Libyans to search for gas and oil that would have seen it take about 19% of any future production revenues. Guma el-Gamaty, the UK coordinator of the NTC, confirms that his organisation had been contacting major companies with existing Libyan contracts and had met some, although he refuses to disclose identities. However, Libya’s rebels are examining allegations of corruption within the country’s $65bn sovereign wealth fund, a probe that is thought to include examining, and perhaps renegotiating, any contracts that were improperly handed out to friends of Colonel Gaddafi’s son, Saif. Other companies also look set to relaunch their Libya ambitions. Last week G4S, the security company that employs more than 600,000 people worldwide, said it was hoping to pick up more work in a post-Gaddafi Libya. Nick Buckles, chief executive of the FTSE 100 company, says he is looking at opportunities to train Libyan police and protect the country’s oil and gas assets. Elsewhere, BP’s rival Shell, which was exploring for gas in the Libyan desert before the conflict, says it has also been in touch with the NTC. Kier, a FTSE 250 listed construction group which is understood to have been examining entering Libya before the conflict, would not say what its strategy was. Lord Trefgarne, the chairman of the Libyan British Business Council, says the body is hoping to lead a delegation of up to 20 of its members to Tripoli and Benghazi, possibly as soon as next month. Oil services firm Wood Group, pharmaceuticals firm GlaxoSmithKline and banks such as HSBC and Barclays remain among the membership of the LBBC. One source with knowledge of the situation in Tripoli says: “The Libyans will be dealing with companies very shortly. In the longer term, other watchers predict that softer industries will also look to seize opportunities in the country, particularly in travel, leisure and retail – although a time when you can buy a sandwich in the Green Square branch of Pret a Manger looks some way off. One seasoned Libya investor says: “This is all in the future, as they have got to sort out the political situation – which will be trickier than you think. But Gaddafi’s vision was building a new airport as a ‘gateway to Africa’.